In the grand scheme of things, my blogging career has been short. Looking over recipes and posts over the last few months has demonstrated to me a few (food-based) traits about myself. The most glaring? I love breakfast. Look back at few of my posts and you’ll see that I mean business when it comes to the ceremony of breaking the fast. And truly, I do. You see, when it comes to making (and in turn eating with afervor) a good breakfast-based meal – I’m like Willy Wonka’s Veruca Salt. So why not keep with that trend and put something together I truly love? A good ol’ fashioned Desayuno Mexicano (Mexican Breakfast!) 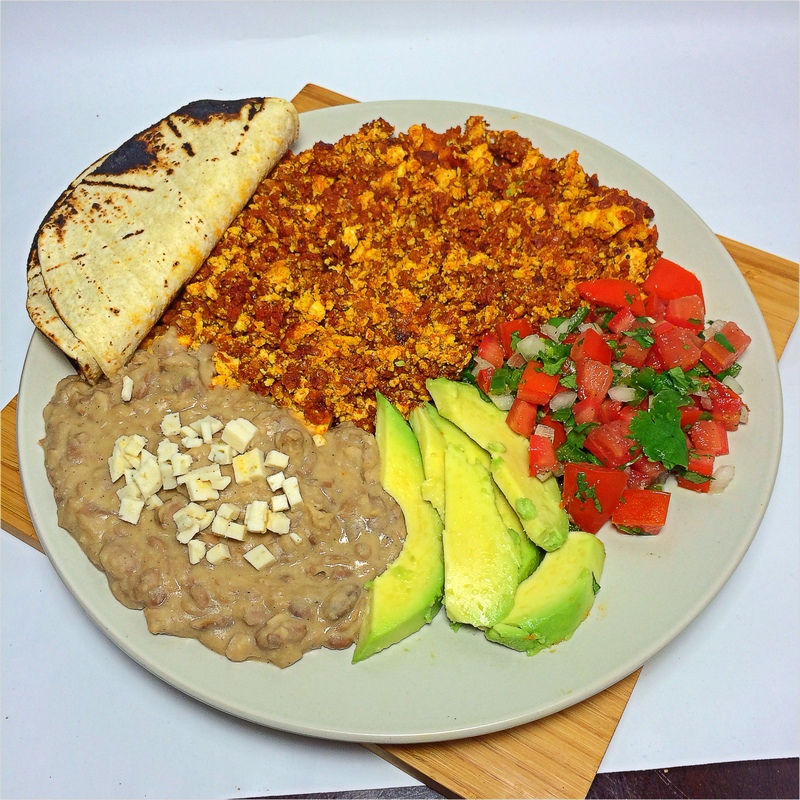 of Soyrizo con Tofuevos, Refried Beans, Salsa Fresca and Tortillas. This combination is by far my favorite. I’ll be honest, there isn’t much to the dish recipe-wise – I’m essentially putting together previously posted recipes into one good meal. But that’s slowly what I’m building to anyways – cataloging the components and building from there. Plus, breakfast is good yo – I think you know this. 1. Marinate your tofu the way I do here – set aside. 2. Heat 1 tsp of canola oil over medium-high heat in a large frying pan. 3. 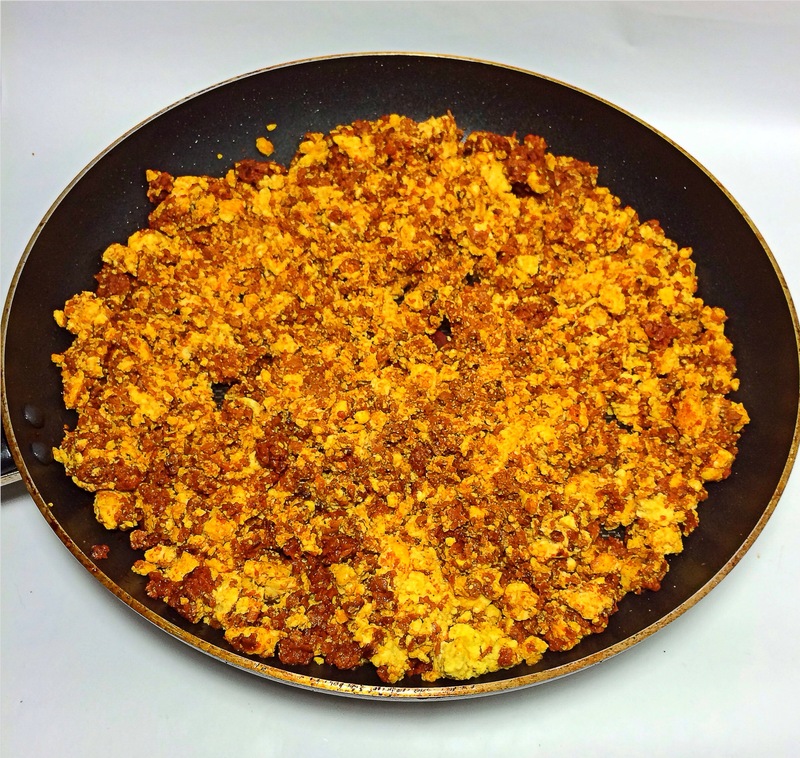 Remove soyrizo from casing and add to pan; break up with a spoon and stir to lay flat in the pan. Cook for 5 minutes – stirring intermittently. 4. Add your TBS of water – stir and cook for 1 more minute. Remove from pan – set aside in a bowl. 5. Add remaining 1 tsp of canola oil to the same pan; heat over medium high heat. 6. Add your tofu mixture – stir to lay flat in the pan. 8. Add your (cooked) soyrizo to the tofu mixture. Stir to mix together. 9. Cook for another couple more minutes until heated throughout. Serve with Refried Beans, Salsa, Avocado and Tortillas.